All my planets were aligned this past weekend. First, it was Becky's weekend on. trusting weather 3 days out, I was beat out on taking Friday off by 2 others. early for the weekends to be crazy. So here day ones plan. Since Becky wasn't with me, bushwhacking was in order. I left home at 3:00. Was planning on 4:00 but the little kid in me wouldn't let me sleep. I decided to check out GG's and thegibba's route on the way there. I'm not sold. It was good early morning Staurday but I think it may have been trouble Sunday afternoon. Those coastal towns can be killer. But, as thegibba said, this is cool. I arrived at the parking lot on Rt. 233 for the carriage road at the north end of Eagle Lake at 8:30.
back tracked to Duck Brook Rd, walked south for a bit, and started the whack up Brewer. crap shoot. Then, I bushwhacked down to the carriage road between it and MacFarland. a .5 mile road walk to the car. an awesome day for great views on Acadia's finest. Some shots along the way. The side of Duck Brook Rd. The little I got from Brewer. Just below the summit of Youngs. Anyway, I think, this makes 15/26 of the Acadia 26. Last edited by JustJoe on Tue Jun 21, 2016 5:25 am, edited 1 time in total. Everything is so beautiful, but, man, that turtle is the BEST!!!!!! This may be true. I think whenever I use it it's either really early in the AM, later at night, or I'm with the family and between bathroom breaks, snack breaks, stopping to go up the observatory or whatever I wouldn't necessarily notice it was a slow go. I still like it, but Labor Day Weekend may not be the best time to use it. I've thought of attempting Brewer before, but alas it is a whack, and not on the list, so, after hearing it has little in the way of views why bother! There is an abandoned trail up Youngs that started on Breakneck Road. 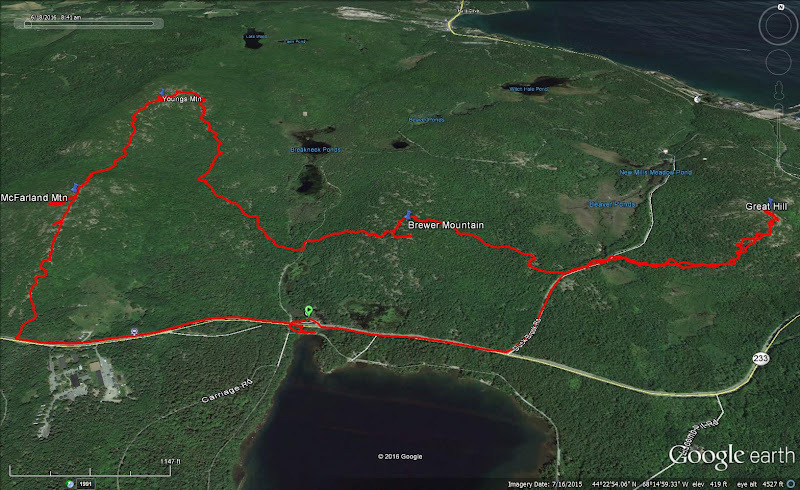 I have yet to find it or any real information on where it actually started, but plan to explore a lot of the abandoned trails and sights of Acadia once the redlining is finished so maybe someday I'll find it. Great Hill looks, well, great! I need to get there. Any of the routes you have used easy enough for an idiot like me with a wife and three kids in tow to find our way up in a few weeks? Shame about the weather too, but with all your stars aligning and Becky needing to work ( that's funny right there! ) did you get to camp and enjoy the stars in those cloudless skies? I'm even more excited to hit up Acadia in the coming weeks! How many "great hills can we fit on "the list". I'll vote a yes on this one also. place. After I insisted it was just a tourist trap and not worth the effort. GG, I saw no evidence of a trail on the route I took up Youngs. And no to the camping. I love the place we stay up there and it was the last chance to get their best, $80 cheaper. Last edited by JustJoe on Tue Jun 21, 2016 7:45 am, edited 1 time in total. 4 hours from Ipswich?! See, you can day hike here more often now! But yeah, whatever you do skip the 1/1A route unless you're just out for a cruise or want to see some lighthouses. Going through Brunswick, Rockland, Camden... Traffic hell in summer. I might just want to drive myself off that bridge after 6 hours of that just to get to it! !